Forget about pool and spa lighting as you know it. Hayward gives you gorgeous LED lighting options to help you create a magical outdoor environment. Whether you&apos;re in the mood for a peaceful retreat or a party vibe, you can create a backyard ambiance that is uniquely you. For New Construction or remodeling, Hayward&apos;s white lights for pool and spa are designed for residential and commercial applications where white lighting is required or preferred. Fiberstars fiber optic lighting systems are safe and affordable. Light with no electricity or heat. Featuring metal halide technology our fiber optic lighting systems. Fiberstars lighting produces a more pleasing light with color change and special effects options. Transform your backyard into a lighting paradise. 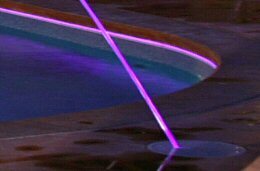 If you&apos;re looking to enhance your poolside environment, LED pool lighting can help you customize your backyard in a variety of aesthetically pleasing ways. Our pool lighting systems allow you to fine-tune your pool environment according to your tastes, resulting in a custom-made paradise that encompasses the entire pool area-it&apos;s a highly effective method of stimulating the senses.